I don't know if this is the lowest scoring Blue but... I'LL TAKE IT!!! Hey Rudy: way to go pal! A lovely illustrative image with lovely colors and capturing the essence of this challenge in good form. Congratulations on your Blue! def not the lowest scoring blue. nice and sharp, good comp. congrats! Congrats on another blue ribbon, excellent shot! Rudy...you did it again! I think this was probably the first time (and I stand corrected) that a 6.5 scored a ribbon...well done! Saturation started to artifact the blues and greens in the bottom of the sky - but still a great image. Well done. Nice moody picture. Congrats on another blue! Wow! You did GREAT with such a narrow challenge! And how cool is THAT to have 2 blues on the front page at the same time! CONGRATULATIONS! Very deserving! Congrats Rudy... you da man!!!! Way to go Rudy! I was about to shout out Untouchables rule but at the moment it's all you baby! Congrats! Wow....Congrats on both entries!!! Your passion for photography and the progress you've made in such a short amount of time is very inspiring. You're truly gifted my friend. The question is, where do you go from here? I see $$$$$ in your future. WELL DONE!!! Congrats Qart on another ribbon...Untouchables rule. Give me a Q! Someone's on a roll! Nice Colors and processing given the basic rules. Nice idea, composition, execution. The ball looks unnatural, overprocessed, shiny, with overblown whites and reds. I think that you could deepen the color in the sky a touch. I like the image, and think that your perspective for the bench and fence is very good. Good shot. Compositionally, you've really paid attention, even lining up the right-hand light pole with the links in the fence. Only quibble I've got is the red on the baseball seems over-saturated, but that's pretty minor. Crisp, well focused image. The red on that baseball just jumps out. I like the colors in this (sky, bench, field). Only negative is it feels quite contrived, but how do you get away from that with this challenge? Hmmm. Anyway, overall I like it very much. Good luck! 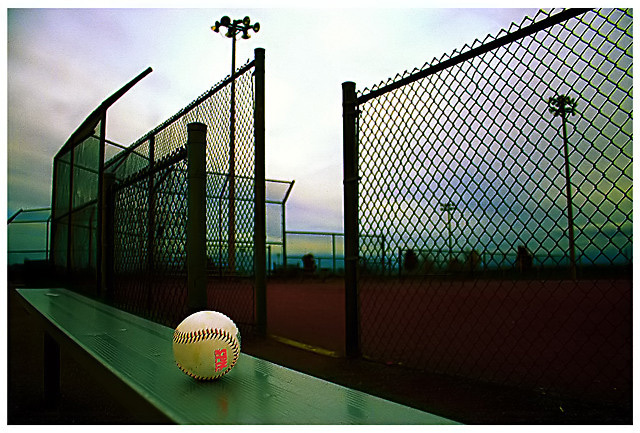 Judging by the halos on the fence and ball, you have over-sharpened this. Oversaturated for my tastes (the fence on right is getting some weird haloing), but I like the composition and contrast. Nice composition, colors and light. The bright orange on the ball takes away from the overall feel of the photo. It is a bit distracting but the composition is quite nice. 6. Very good shot. Well-composed, aweasome color, light and ballance. I really like the green hues here, especially against the white of the ball. overall score: comp-2, MC-2, PP-1, impression-1, wow-0 = 6.
and apart from that, i think ultrapinky colour on the ball is a bit distracting. my eyes are drawn to it all the time i try to look at other parts of image. Proudly hosted by Sargasso Networks. Current Server Time: 04/21/2019 01:00:20 PM EDT.